The happiness of our customers is of utmost importance to our team, and we work hard to ensure that every mission exceeds expectations. When we hear from a satisfied customer, we make it a point to find out what made their experience stellar, so we can replicate that success for every business we work with. Douglas K. Smith is a VP at NAI that used our drone aerial photography to showcase one of his real estate properties. After a smooth first experience, Doug is a self-described "happy camper", and the DroneBase team is committed to eliciting that reaction out of all businesses we work with! 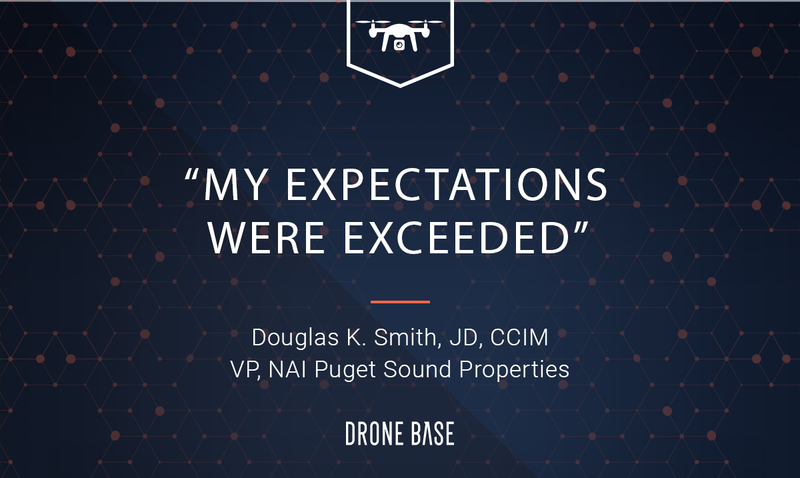 Read on to learn more about Doug's customer journey with DroneBase. Why were you interested in trying DroneBase? DS: A DroneBase sales representative contacted me about using the company’s services [...and] I was about to list a stunning, 8+ acre water view parcel of raw land that would be suitable for development as condos or a large apartment complex. To show potential buyers the awesome marine view from that site, drone photos, and especially the 360 degree view, would be perfect, so I reached out to inquire about pricing, etc. I received sample shots taken of other properties to get an understanding of what I was to expect, and I was impressed with the capability of the equipment and the quality of the photos. The pricing struck me as very reasonable. I was then passed on to another sales rep who, over a period of quite some time, answered the many questions that I had. That sales rep, Justin Sohn, was very knowledgeable and responsive. Based upon my overall experience with Drone Base up to that point, I decided to use the company’s services. Did DroneBase live up to your expectations? DS: My expectations were actually exceeded. Weather was a crucial matter because my goal was to capture the terrific water view on a particularly clear day. Our area was plagued for several weeks with forest fire smoke that created a haze. When that finally blew away and the weather forecast was good, I placed the order. Drone Base was able to schedule me in a very timely fashion for the time slot I requested. I was told that the local pilot would contact me, which he did. He was very professional and helpful as well. It turned out that the time slot I requested due to the property owner’s schedule didn’t work after all. The drone pilot readily agreed to reschedule our appointment to later in the day. He called me en route and arrived as scheduled. His equipment and knowledge were impressive. He worked very closely with me to take exactly the shots that I wanted, both 360s (two of them from different locations on the site) and 15 still photos. He was able to fly out over the water, to get photos looking back on the land, something that I had not expected to be possible. My images were emailed to me the following day (a Saturday). I was extremely satisfied in all respects. What would you tell another customer considering aerial imagery? DS: I would tell them to use this company! I have already arranged for DroneBase to be added to our company’s recommended vendor list, and I've shown my photos to the other brokers in our Tacoma office at an office meeting, recommending they use this service when the need arises. DS: Keep up the good work. Maintain your relationship with the local contractor/pilot, who was very professional. We appreciate Doug's nod to our professional network, and our team of drone pilots are ready to service your business needs today. If you're ready to start using aerial imagery, contact us today to get started!